Modern gardens face new difficulties, including pressure from our woodland friends, deer. These bulbs are least appetizing to hungry creatures, including deer and squirrels. Unique CharactersticsBrecks: A sudden bloom of grape hyacinth is an elegant way to announce the arrival of spring. Also known as muscari, this ornamental garden plant is not your typical spring bloom. Its distinguishing feature is its tightly packed urn-shaped flowers. While these flowering bulbs usually appear in different shades of blue that range from sensual pale blue to dreamy turquoise to startling black-blue, we also have rare shades like pink and white. 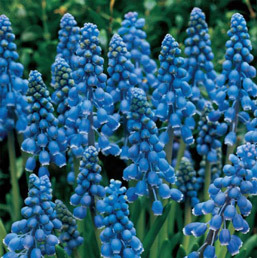 Like most spring-flowering bulbs, the right time to plant muscari grape hyacinth is in the fall. It is a hardy flowering plant that does not require a rich soil to flourish. However, this bulb grows best in well-drained soils and in direct sunlight or partial shade. Planting grape hyacinth bulbs requires holes that are up to 4 inches deep, and they must be spaced at least 3 inches apart and watered regularly as they develop roots and leaves during the fall. 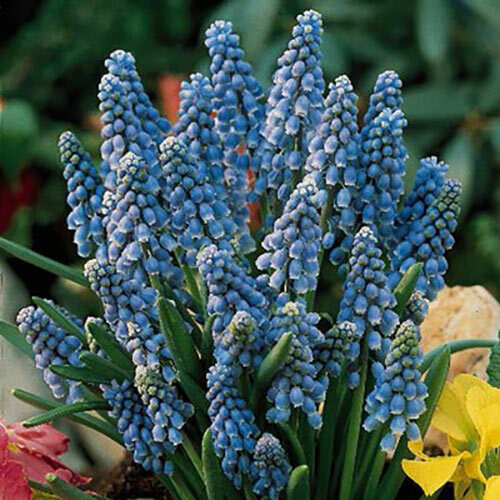 Grape hyacinth flowers bloom in spring and cluster around rigid stalks, a bit like how grapes cluster. Each flower is a composite of six fused tepals formed in a bell shape with a constricted or a fluffy wide opening. With a strong, long stalk and eye-catching clusters, these flowers make for lovely bouquets. After blooming completes, it is time to prepare a grape hyacinth garden for the next year. By pruning the leftover flower spikes and green seed pods, the green foliage of the plant nourishes the bulb more effectively. In turn, these leaves yellow and die during the summer, the grape hyacinth bulbs' dormant season, and will then need to be pruned. Muscari grape hyacinth effortlessly seeds itself. Therefore, it can naturalize a rock garden just as easily as a meadow grows--it needs little help from a gardener. If you desire a colourful spring surprise every year, then our wide selection of Dutch bulbs will help you grow a truly enviable muscari garden.